An inclusive workplace is one that ‘values individual differences in the workforce and makes them feel welcome and accepted’ states Dr. Pragya Agarwal, she reminds us in a recent publication entitled ‘How Do We Design Workplaces for Inclusivity and Diversity’ (Forbes magazine - 19th July 2018). The articles highlights that in order to successfully design workplaces for inclusivity and diversity, the principles of Inclusive or Universal Design should be incorporated into the design and users of the workplace should be involved in the design process from the outset. To offer successful inclusion and diversity and create happier workplaces, organisations must understand human differences, be open to change, and be willing to provide a variety of choices in the workplace. Providing suitable door handles and openings for people with limited manual dexterity, such as levers instead of knobs. Use the "closed-fist rule" where suitable handles are used that can be operated with a closed fist, allowing access to everyone. Space considerations as per anthropomorphic parameters. 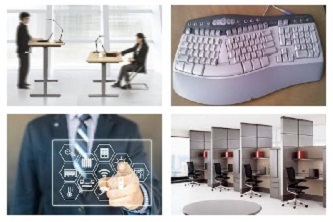 Ergonomic keyboards and a thorough assessment of work stations and seating. Standing stations for those who prefer to work in this way. Different sized spaces for those who prefer to working alone and others who prefer working with people around them. Multi-sensory safety alarms (auditory; visual), and large-print instructions for emergency and safety equipment. Textural and different coloured walls and surfaces for visually impaired, and mange changes in elevations along walkways and corridors. For Dr. Agarwal’s full article on the Forbes website please click here.